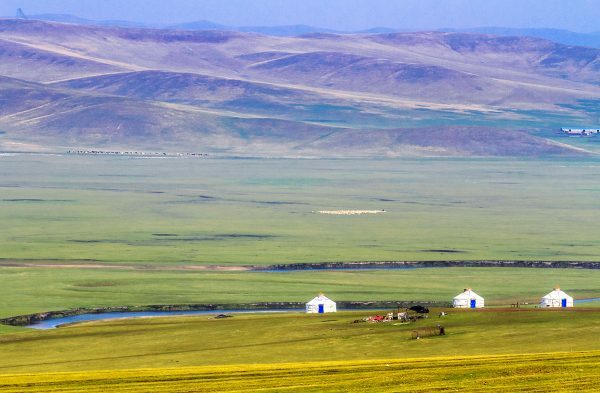 As one of the largest prairies in China, the Hulunbuir Grasslands represent some of the finest patches of untouched wilderness in the country. With over 3,000 rivers, 500 lakes, countless woodlands, and vast meadows making up its expanse, the grasslands are a treasure trove of natural beauty and wonder. Aside from the Greater Khingan Mountains stretching from its north to its south, the area is markedly flat and provides virtually endless views of its lush greenery. Many diverse ethnic groups call this verdant paradise home, from the Mongolians and the Han Chinese to the Manchu and the Daur people. The grasslands themselves are named after two lakes that lie at their centre: Lake Hulun in the north; and Lake Buir in the south. Lake Hulun is the larger of the two, while Lake Buir lies partially within Inner Mongolia but predominantly in Mongolia proper. A dazzling local legend recounts the origin of these two lakes. There once was a brave Mongolian tribe who boasted a famous couple: a beautiful girl named Hulun, who was renowned for her skill at singing and dancing; and a strong boy named Buir, who was celebrated for his talent at riding and shooting a bow. One day, a demon came to the prairie and threatened the safety of their tribe. The couple fought against the demon until the girl, realising they could not defeat it in combat, transformed into a lake and drowned the demon. By sacrificing herself, she saved the entire tribe. The boy Buir was so distraught at the loss of his love that he too turned into a lake. In short, rather than crying a river, he wept a lake! This is how the two matching lakes of Hulun and Buir came to be. Pearl white yurts are dotted throughout the jade-hued grasslands, where farmers while away their leisure hours in the serenity of nature. Nowadays, while the grasslands and lakes continue to be popular tourist attractions, they are mainly used for grazing livestock and farming. Their vast fields abound in horses, sheep, cattle, cashmere goats, and even camels! In fact, the grasslands are held in such high esteem that any produce from the region, such as meat, milk, leather, or wool, is highly sought after. The low level of pollution in the area means that many Chinese people regard animal products from Hulunbuir as “purer” than those from anywhere else. The region’s northerly location makes it warm and pleasant in the summer, but cold and snowy in the winter. During the summer, the grass looks as green as emeralds and the meadows are awash with a blanket of multi-coloured wildflowers. Visitors can spend blissful days galloping across the plains on horseback, riding camels, taking a tour on a horse-drawn cart, or paddling a boat out into one of the lakes. On festivals or special occasions, wrestling, archery, and horse racing competitions are held throughout the day. In the evening, the smell of traditional roasted lamb wafts on the air and people gather around crackling bonfires as the sun goes down. Even in ancient times, this place was renowned for its beauty and was immortalised in a Chinese poem, which describes it thusly: “The sky is blue, and the grass is boundless; when the long grass bows in the wind, suddenly the horses and sheep will appear”.